Ropes supporting the equipment broke this afternoon, sending it crashing to the ground. 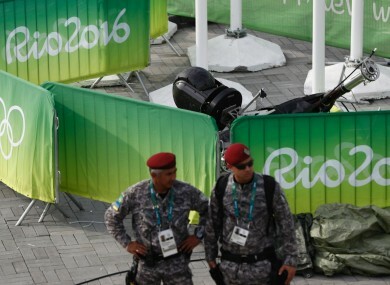 A LARGE CAMERA operated by Olympic Broadcasting Services crashed to the ground at Rio’s Olympic Park today, injuring at least seven bystanders. Videos of the scene posted on social media show a camera that appears to be at least six feet long crashing down to the plaza near the main Olympic basketball arena. Another shows two women seated next to the downed apparatus, one of them with a bloody nose. OBS said in a statement that a rope used to pull the camera came down around 1.30pm local time and a team was sent to investigate. The camera was suspended about 10 metres above a concourse at the time and had two support ropes still attached. While repair crews awaited the arrival of a cherry picker, both ropes snapped and sent the camera down approximately 20 metres to a lower concourse. Officials said seven people suffered “minor injuries” as a result of the incident and an investigation has been launched. The area where the camera fell was later cordoned off and guarded by security officials. Email “Seven injured in Rio after overhead camera falls at Olympic Park”. Feedback on “Seven injured in Rio after overhead camera falls at Olympic Park”.